On the last day of her classes with him, the young singer alleges that OS Thyagarajan molested her, and later emailed her persistently even after she went back abroad. Anupama* was 20 years old when she went to renowned musician OS Thyagarajan for classes. This was four years ago, she says, when she lived abroad and was visiting India for a break sometime in July. Her love for Carnatic music took her to the home of one of the most renowned artists in the field, a sabha favourite, a regular in concerts arranged in foreign countries, guru to several star singers who are active in the music scene today. 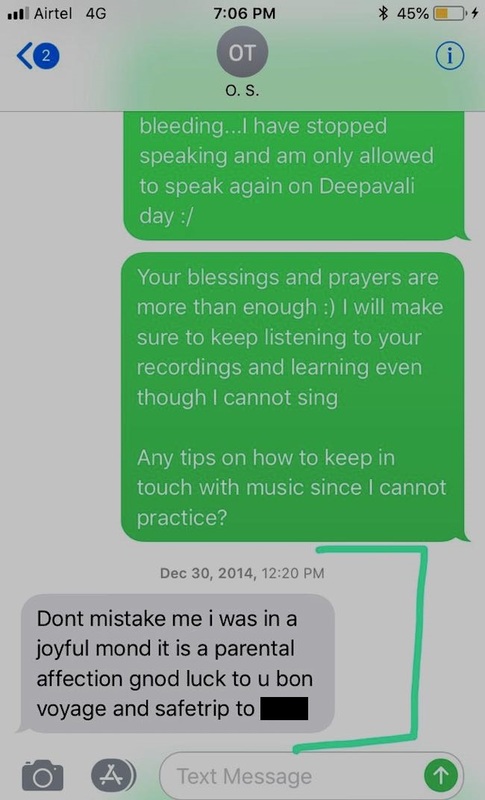 And on the last day of her classes with him, the young singer alleges that OS Thyagarajan molested her, and later emailed her persistently even after she went back abroad. Speaking to TNM, the young woman is careful to stress on what she was wearing when she met OS Thyagarajan during her classes. "I mostly dressed in salwars," she says at least twice in the conversation, though the question is never asked. It's a detail women world-over include in their testimonies about sexual violence because they anticipate the victim-blaming that inevitably follows. The reason the #MeToo movement has exploded in India, after a stormy beginning in October 2017. "He is a senior vocalist and a senior member of the fraternity," Anupama begins, "I think in a lot of ways, their age and power trumps over their conduct. I got in touch with him through some random avenues, trying to get a concert opportunity somewhere and he happened to be the one picking up the phone and he said something like..you know...email me a recording or something. And I was looking for a teacher at that time. I sent him the recording and a day later he responded saying 'Such a good voice!' and whatever." Anupama says she was flattered to hear this from a senior member of the fraternity. She hadn't interacted much with professional musicians before this. "I immediately got very excited, told my parents. He said why don't you meet me for class. There was nothing to question at that time. So I said fine, I went to his house with a relative first," she says. The young woman went to OS Thyagarajan's house in West Mambalam, Chennai, with her cousin's husband, taking fruits and other items as per tradition for the first day of class. "I remember – and this was a trend all through – his wife was never present during the classes. She was always restricted to the kitchen or somewhere else in the flat," she says. Anupama was the only student during those classes. The first class went well and Anupama got a concert opportunity after a couple of classes. "I got a concert opportunity in Chrompet where he was singing the next day. So I was able to put his name down and I thought this had more validity and that this was going well. And over the next six months, I was quite busy with college stuff and I was also working somewhere. We'd have classes on and off. In these six months, there were a few comments made when I'd come from college wearing jeans and a T-shirt...I mostly wore a salwar...and he'd say "looking very fashionable" or something. But nothing that made me feel like anything was going to happen to me, nothing that made me feel unsafe," she says. At the end of her extended stay in India, Anupama went to tell the musician that this was going to be her last class and that she'd be happy to continue learning music from him through Skype calls. "We had the class and everything went as per normal. I think I was wearing a salwar or something. I did a namaskaram like it's usually done in the music fraternity to your guru. You seek their blessings and you take your leave. I did namaskaram and got up thinking he will shake my hand, and I'll leave. So I got up and he suddenly pulled me into a hug which I found very strange. But I was also like ok, you've developed a rapport with someone, it's a fatherly hug. He pulled me into a hug kind of forcefully and then suddenly I felt that I was being groped from the front. A few people I've talked to have asked me why didn't you scream, why didn't you hit him or run. But I think your body goes into such a state of shock at that point and you really kind of freeze. I noticed that I was being groped, I noticed that his face was kind of buried into my neck...trying to find something to kiss. And I noticed that we were in the living room of his flat and one of the bedrooms was behind him. I noticed being pulled into one direction, towards the room. So immediately, my fight or flight instinct kicked in and I knew I had to do something before it went to another level. I don't remember if the front door was open but I do remember these details," she alleges. Then, Anupama says that she pushed him away and said, "Okay mama, I'm leaving now. Thank you." "I was in complete shock. I don't remember him saying anything. I couldn't really believe it. I was supposed to go to my uncle's house for lunch, so I left. I remember thinking that I can't cry, that I can't show that anything has happened. I can't look like anything has happened because someone will ask, why do you look different. I think even at that time I had the awareness that this person is a very well-known personality and you can't say anything. If I say something, no one in my family will believe me. By the time I went to my relative's house, I'd convinced myself that nothing had happened. I decided that I'd made this all up and that I'd imagined it. Then I received a text message from him... I still have it… It was something along the lines of do not mistake me, it was parental affection. Just that," she says. It was then that Anupama realised that something had indeed happened and that he'd felt the need to explain himself. After she left India, OS Thyagarajan allegedly constantly sent her emails asking when she was coming back. Anupama recalls feeling very conflicted about it. She had one phone session with the musician after which she stopped classes, although he allegedly persisted in sending her emails. "It took me a while to tell anybody about it. But when I did, my dad asked me why I wanted to learn from him. I was of the mindset that this is what it takes. I thought maybe this is what people have to go through. You keep hearing stories like that. I thought it was part of the struggle," she says. Anupama says that a lot of people have asked her, why pursue arts in this country if that’s what it takes. “To that end, the majority of artists I have met – men and women – have been amazing people whose company I value, and who have helped me grow and continue to evolve. Yet, as any field we’ve been seeing/following, the arts are not invincible to this phenomenon, just because they carry a certain religious connotation, or the artists are viewed as pious on stage. Therefore, it’s important to separate the art from artist and keep in mind that the personality you see on stage is not always reflective of the character underneath,” she says. “The goal of speaking out now is not to warn people away from pursuing the art and pursuing your passion. But for the multitude of parents and children who are unaware and make themselves vulnerable, it’s an effort to make this a safe and positive space that focuses on the positives of classical arts instead of making it a breeding ground for conduct such as this,” she adds. When Anupama moved back to India a couple of years later, she made a conscious choice not to go for OS Thyagarajan's concerts or meet him anywhere. She did not speak about what had happened because she was worried about the repercussions on her fledgling career. She has not met OS Thyagarajan since. The musician's name has surfaced in the list of alleged sexual harassers in the Carnatic music field that singer Chinmayi has put together on Twitter as part of the #MeToo movement. When TNM reached out to OS Thyagarajan and asked him if he'd molested a student in the past, the musician denied the allegation. "This is a false allegation. I'm a very orthodox man. I don't indulge in such acts," he said.